Being a trailblazing “millionaire hipster,” called such by The New York Times nearly nine years ago. Remixing anthems of the pacifist movement in ’60s and ’70s into dance-club background tracks. Appearing on various reality shows, including one about wannabe superheroes. 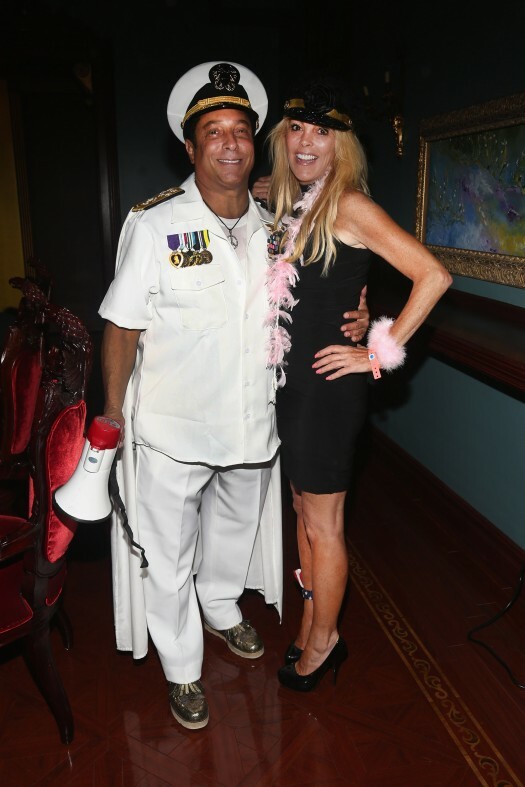 Wilzig decided to throw a nautical-themed party at his New York castle over Labor Day weekend. The New York Daily News reported the estate was dressed up “like a three-story gray battleship.” He invited 500 guests who donated at least $200 to his Peaceman Foundation, which, per the Sir, was “established to battle hatred and violence” and donates to many military-related charities. And what better way to celebrate such an organization than by playing nautical dress-up and wearing a rack of medals — including one sported by nearly every beneficiary of some of the charities mentioned above — over the right breast pocket? Sir Ivan’s heart may very well be in the right place. His Purple Heart isn’t. But hey, at least it’s not blocked by Dina Lohan’s feather boa. Why the hell is this jerk wearing a Purple Heart? I seriously doubt that he earned it … or even knows what it represents. Looks like a case of stolen valor act and he should be fined heavily if not in jail. actually he can go to jail for wearing that. dosent matter where his heart is,some things you dont mess with, and its against the law. “…to battle hatred and violence…” That’s a joke! I’m hearing how Christians are being attack in the military left and right these days by the “sweet and innocent and misunderstood” fairies that proclaim to be so open-minded. Thank God we didn’t have to put up with them when I was in the Navy. He’s also wearing shoulder boards for a Fleet Admiral and if you look closely he’s wearing a Trident. Classy all around. His shoulder boards aren’t even on correctly. Is this relevant to ANYthing? I think not. Wait. What? He is not in the Navy? I thought this was another story about a relieved skipper? Shouldn’t Navy Times call this section the “Poop Deck”? The guy probably sent his PA to a costume shop. He’s not trying to gain money/attention, He’s just dressed for a costume party. Good lord. Hiesenburg, you’re wrong. Having a bonehead like this guy wearing a purple heart is not only against the law, it’s also an insult to anyone how earned the medal wounded in combat. I’ll bet money that there’s a Trident somehwere in Dina’s underpants drawer. That guy is nuts. If you hang out with Dina Lohan for more than 10 minutes, you’re going to test positive on something. 1) Remove all of the ribbons. 2) Tell the bum to button his shirt, tuck it in and stand up straight. 3) Give his a swift kick in the @$$. 4) Throw him in jail. No punishment is necessary; he lacks the mental competency to realize he’s doing something wrong. (And, on the serious side, I don’t think he is “impersonating an officer,” because he knows no one will think that’s what he is; and he isn’t trying to profit from what he is doing). He’s just clueless and silly. Back to work. How about we just take this worthless story and picture off now, and give it a rest?? He looks like a banana republic dictator. I’ll bet BHO would love to have a uniform like that. It’s the bartender from the Love Boat. His heart may be in the right place, but wearing real military medals, including the Purple Heart is shameful. Many have lost limbs and lives earning that medal through sacrifice. I know… How about we waste tax dollars finding this guy and locking him up. Get your pitch forks, rouse your rabbles. The whole thing just makes me laugh because he just looks like a fool. Tennis shoes, ribbons jacked up, just get over it people.